One of the early acts of the first territorial legislature in 1849 was the organization of eight counties: Ramsey, Benton, Washington, Itaska, Wabasha, Wahnata, Mahkahto and Pembina (spellings are 19th century versions). Anoka County was organized from land originally part of Ramsey County by an act of the Territorial Assembly on May 23, 1857. Eight Anoka County townships were also created that year: Anoka, Watertown (later renamed Dover and then Ramsey), Round Lake, Bethel, Columbus, St. Francis, Oak Grove and Centerville. 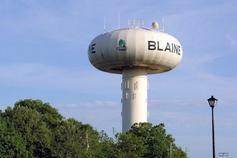 (2) The area that later included Blaine was part of Anoka Township. In the spring of 1877, landowners in eastern Anoka County decided to start an action that resulted in the separation from Anoka Township. In June, 1877 the new township was approved by the state and county and the first election was held on July 7, 1877 – at the home of S.C. Tisdale. The township’s first board of supervisors were Moses Ripley (chairman); George Tisdale and Richard DeLong; also G.F. Murrell (clerk); H.P. Winder (assessor); Thomas Schlief and Thomas Conroy (justices of the peace). At the suggestion of Moses Ripley, the township was named for James G. Blaine, a politician from Ripley's home state of Maine. Blaine had served in both the Maine legislature and the U.S. Congress; he was Secretary of State under Presidents James Garfield and Chester Arthur and a candidate for U.S. President in 1884. The 1880's and 90's also saw land speculators in Blaine Township, most notably James T. Elwell, who purchased 52,700 acres, on which he established two livestock farms: Golden Lake Farm in Blaine and Oak Leaf Farm in Ham Lake. He built a road with a system of ditching that connected the two farms. This road, known as the Elwell Grade, later became a section of Lexington Avenue. In all, he built 200 miles of ditches at the cost of $1,000 per mile, making marshy areas suitable for farming. Albert Johnson and Lorenzo D. Parker also purchased large sections of land in the township, establishing a horse farm. Albert Johnson willed his fortune and land to his cousin Edna Dickerson, who built the Radisson Hotel in Minneapolis in 1909. She and her husband, Simon Kruse, grew produce for the hotel's Flame Room Restaurant on the land later known as Radisson Farm. School was first taught in private homes, including the home of John Golden, before schoolhouses were built. Six school districts were organized in Blaine around the 1880’s and 1890’s. District 48 was established when a schoolhouse was built in1880 on what became Lexington Avenue near Golden Lake. The enrollment was 12 students. In 1900, a new building was built on the corner of Lexington and Lovell Road and called the Lovell School. It was demolished by a tornado in 1929 and rebuilt. In 1956 the district was reorganized and District 48 became Centennial School District 12. Between 1883 and 1884 land was purchased to build a one room schoolhouse on the northeast corner of what became Radisson Road and Highway 65 (now Highways 65 and 10). Enrollment was 4 or 5 students. This was School District 47, later incorporated into Spring Lake Park School District 16. School District 61was established around 1894 when a schoolhouse was built in what became the Johnsville community. Eight students were enrolled the first year. District 61was consolidated into Anoka-Hennepin School District 11 along with dozens of other small rural school districts in 1952. Two other school districts located in Blaine were District 34 and 67. In 1892 a proposed railroad to go through Blaine was voted down as stated in the township minutes: "Vote for a right-of-way and bonus for the railroad was defeated", thus limiting potential industry in Blaine. When the township was formed in 1877, there was no official meeting place. The board met in various homes and later a schoolhouse. Although a vote for the first town hall was defeated in 1892, it was approved in 1900 and built in 1901 for $350. The March 12, 1901 meeting minutes state, “On motion it was resolved to build a town hall this year...The location of said town house to be on the corner of road where it joins the old Rice Creek and Bethel Road the above said road running East and West between Sec. 21 and 28” (Now Radisson Road and 101st.) The town hall was said to have burned down. (4) A second hall was built on one-half acre of land donated to the township by Charles J. Swanson in 1904 on what is now 109th and Radisson Road, then considered to be the center of town. The hall served for decades as a meeting place for governmental, organizational and social functions, but by the 1960's it stood abandoned. However, efforts were made to preserve it. The Blaine Jaycees cleaned it up and used it for meetings in 1964. In 1973, discussions were held between the city and a newly-organized Blaine Historical Society (forerunner to the current Society) to move the town hall to the city hall complex on Central and 91st Avenue and retire it as a memorial to Blaine's history. Jefferson School fifth graders raised $40 to clean and restore it in conjunction with the historical society. Spring Lake Park High School seniors began a re-painting project in 1976. On August 8, 1977, one hundred years after the founding of the township, the old town hall was destroyed by fire. To avoid further land being taken from Blaine (like those in the areas of Circle Pines and Lexington) and the threat of Spring Lake Park taking additional land, the township was incorporated as a village on January 28 1954. (5) An election for the first officers was held on February 20, 1954. Alfred Bernstein became Blaine's first mayor; C.E. Gottwaldt (clerk); Carl Otte, Louis E. Steffen and Ed Harrier (trustees); Robert G. Dahl (treasurer); Edna Bremer (assessor); Marvin W. White and George Applequist (justices of the peace); Henry A. Piotrowski and Ronald Hill (constables); Thomas Forsberg (village attorney). Alfred Bernstein served as mayor for ten years and was the only mayor of Blaine as a village. After World War II, starter-home developments sprang up in southern Blaine. Other housing developments appeared in the 1950's. According to the village minutes, on May 1, 1959, developer Vern Donnay presented the village council a preliminary layout of land for 1,500 houses on 480 acres between 102nd to 109th Avenues on University Extension and eastward. The plans included a fully-equipped park and playground area with a swimming pool and baseball diamond. It was called Oak Park Addition. In June, 1960 Donnay presented plans to the village council for a shopping center at 109th and University Extension called Oak Park Mall. The estimated construction cost was $750,000. With land acquisitions in eastern Blaine, the Metropolitan Airports Commission established the Anoka County-Blaine Airport/Janes Field (6) in 1952. The University of Minnesota played a prominent role in the airport's early history. Its aeronautical engineering department's flight facilities program and administrative building were moved there that year from an airport located two miles east at County Road J and Old Highway 8. The facilities program included student flight training, a charter service for the University and chase support for the University's balloon research, begun at the old airport. The upper atmosphere balloon projects, many launched by university physics professor Edward Ney, sponsored by NASA and the Office of Naval Research, were key to America's entry in the space race. The University Hospital later used the flight facilities for its organ transplant program, also as a neonatal air ambulance and transport for Medical Outreach doctors and nurses to hospitals and clinics in outstate Minnesota. The University's flight training program came to an end in 1989. The flight facility, managed by Waldo Anderson for 37 years, was closed down on June 30, 1996. The University's flight needs were then handed over to private charter companies. The airport houses the Golden Wings Museum, featuring aviation history and a private collection of airplanes. The American Wings Air Museum (AWAM) featuring numerous aircraft displays and memorabilia from the early days of aviation through the modern military era, was started as a Vietnam War-era museum. The AWAM closed in 2010 and became a mobile museum. In 1962 the airports commission acquired the Radisson Farm, which is occupied today by the National Sports Center and the Victory Links golf course. In 2007 the airport's runway 9/27 was extended 5,000 feet to accommodate corporate jets. Northtown Mall was built in 1972 attracting shoppers from the surrounding communities. On November 3, 1964, charter to make Blaine a city was proposed by the charter commission and approved by the village council. It was adopted by a general vote of 2,989 to 1,343. December 3, 1964 was declared “City Charter Day” by Governor Karl Rolvaag. The first mayor of the city of Blaine was W.R. Swedeen. Jerry Trapp, Don Knoll, Ray Omann and Ray Johnston became the city's first council members. They took office on Jan 1, 1965. In 1963 Blaine voters approved a $150,000 village hall bond issue. The building was completed in March, 1965 and became the new city hall, located at 9150 Central Avenue NE. It housed a municipal court, police department and administrative staff. An addition was built in 1976 and was occupied by the police, inspection, public works and engineering departments. The city hall was demolished in 2002. In 1997 groundwork began for a new city hall. Construction started in 2000 for a 114,890 square foot building at a cost of approximately $15,000,000. Completed in 2002, and located on 109th near Radisson Road, it faces the site of the old town hall. (1) History of Anoka County, by Albert M Goodrich, Hennepin Publishing Co. Minneapolis, 1905. Reprinted in 1976, p. 4. (3) Anoka County Minnesota Collection of Historical Stories and Family Histories, Taylor Publishing Company, Dallas, Texas, 1982. (4) This statement was made by Mr. Harold Rickaby during a talk to a fifth grade class and included in an undated typewritten report, Notes on Blaine's History, by Mrs. Zikmund. (7) Census figures for 1950-2010 were obtained from the following web site: http://en.wikipedia.org/wiki/Blaine._Minnesota. Other census figures are from newspaper sources. "U of M flight facility ends 45 years service at Anoka," by Richard Coffey, Minnesota Flyer Magazine, July, 1996, pp. 12-14. Blaine Township, Village and City minutes. "Remembering a One Room School in Blaine 1917-1925," by Elizabeth Bremer Frischmon, Blaine Banner, September 7, 1974. "Fire destroys old township hall, barn," Blaine-Spring Lake Park Life, Vol. XVII, No. 15, August 12, 1977.